Your my World profile page is the hub of your eBay user interaction. Your About Me page is there for customers, and the my World page is mostly used by the eBay community. People like to know about other people, and the my World page shows your world, your way. Just click your user ID on your my eBay page (or any page for that matter) and you’ll arrive at your own (ready-to-fill-out) my World page. If you go to the hub, click the View my World button. After you click through, you see a page ready to edit. The page is pre-populated with the items you are selling — but wait — you can add a whole lot more! To beef up your page, start here. 1At the top of your profile page, next to your user ID will be a tiny pencil icon and the word Edit. Click Edit. 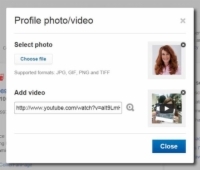 2To add your photo and/or a video, click Add Photo/Video. The Profile Photo/Video window pops up. To put a photo on your page, click the Chose File button under the words Select Photo. A window to your hard drive appears and prompts you to search your computer for a photo. Select your photo from the folder, click Save, and the photo appears on your page. To add a video in the Profile Photo/Video window that opens, type the YouTube URL for the video you want to share in the Add Video box. A preview will appear on the right. When everything looks right, click the Close button. 3Under the cartoon word-balloon icon are the words Write a greeting. Click this link to add a short introduction for your page. This is a good place to draw in your visitors. 4Under Connect Social Profile, click the Share icon to connect your account to Facebook. This way, folks visiting your profile will be able to join you on the social media network. 5Click under the pen icon and a world opens up with places to fill in your Personal and Business Information. Things I Sell. The terms you use here to describe your wares are most important; these keywords help future bidders find you through eBay’s search engine optimization (SEO). Use keywords that will show up in an online search; don’t just describe. Things I Buy. Keep this description very general. Things I collect. If you have a particular passion, list it here. You may meet others who have similar interests. Favorites. Books, movies, music/bands, and TV shows are all options you can add. 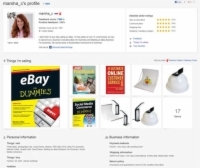 By including this information, you let other eBay members know more about you. Payment methods. List the payment methods you accept for payment on eBay here. Shipping information. List the different vendors and classes of service that you use to send your eBay items. Return policy. Type in your return policy in the box provided. You may have different return policies for different items, if that’s the case, suggest people check your listings. 6When you’ve finished filling in the information that you care to share publicly, go back to the top of the page and click Close Edit. Your new profile will appear.